An enjoyable day of photography doesn’t have to end when night descends. 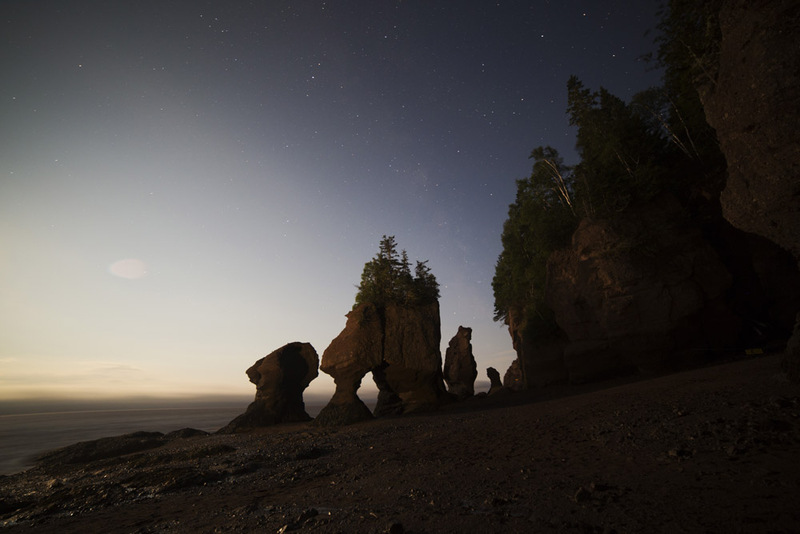 While in New Brunswick I joined Kevin Snair, a professional photographer and interpretive guide for a session of night photography in Hopewell Rocks Provincial Park. The coastal park looks out onto the Bay of Fundy, the location of the world’s highest tides. As much as 160 billion metric tonnes of water, more than in all the world’s rivers combined, flows in and out of the bay with each ebb and flow of the tide. Every six hours and 13 minutes the water level rises or falls between 10 and 14 metres. That rapid change in the water level means that people who don’t know the area and are down on the beaches, beneath the park’s steep cliffs, run the risk of being stranded in one of the bays when the tide turns. “What you’re really paying for is someone who knows these tides and can keep you safe in a place that could potentially be very dangerous,” explained Kevin, who has been a professional photographer since 1990. 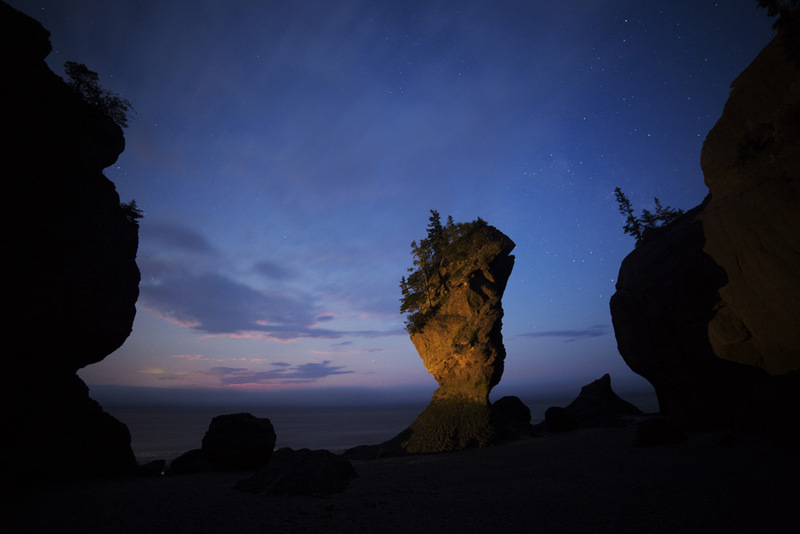 He guides photographers of all levels on his Hopewell Rocks Night Photography Excursion. Due to the nature of the tides, he can only operate the two-and-a-half hour excursions five nights out of every fourteen. A calendar showing the availability of his tours is displayed on his website. “It’s beyond the experience of doing photography. I know the park intimately, so can take you from place to place without searching for those individual spots,” said Kevin, while I asked him why even experienced photographers pay for his services. The groups he leads have a maximum of five photographers, which mean that there are not too many people getting in each other’s way down on the beach and ensure that he has time to provide one-to-one tips to participants. Each participant is allowed to bring a non-photographing guest. That means travelling friends or partners don’t have to spend the evening alone. I’ve long been a keen low light photographer and always carry a sturdy lightweight tripod when travelling. My Rollei C5-i weighs 1.7kg and one of the tripod’s legs can be unscrewed and the head mounted on it, converting it for use as a monopod. This proved a useful attribute while photographing the region’s colourful birdlife. 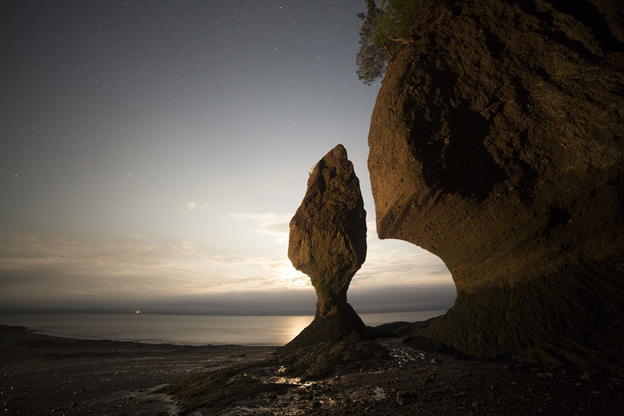 Hopewell Rocks at night in New Brunswick, Canada. The rocks are by the shoreline of the Bay of Fundy, the location of the world’s highest tides. I’ve always kept my ISO to a minimum during night photography, sometimes resulting in exposures of several minutes. Photographing with Kevin introduced me to a different approach to low light photography. He’d suggested that we bring and use the widest lens we owned, so I mounted my fully manual Samyang 14mm f2.8 lens. After we walked down to the beach, at dusk, he encouraged us to set the focus on our lenses to a point around 10 metres away. To my surprise, we kept the aperture wide open. He then came around and locked those settings in place using masking tape. “I think the thing that people go away with is the idea of locking your focus before it’s dark. If you don’t have your focus down before you start you’re going to be fumbling all night. That’s a key part right there,” he explained. He also encouraged us to think differently about our ISO settings. All participants were asked to bring a camera whose ISO could be increased to at least 3200. Rather than keeping the ISO to 100, minimising noise, he suggested we start by setting our ISO at 1600 and to have no worries about going even higher if we thought it necessary. The chief reason was so that we did not get star trails in our photos. The rotation of the earth causes stars to appear as streaks of light rather than specks of brightness on exposures upwards of around 30 seconds. The sky above the remote Hopewell Rocks has little light pollution, meaning it’s possible to see the stars of the Milky Way. Kevin told us he’s often seen the Northern Lights. Unfortunately, the Aurora Borealis did not dance for us. Tidal and weather erosion have played roles in shaping the rocks. 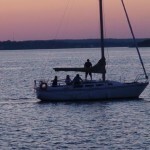 Kevin encouraged us to capture their silhouetted shapes against the last vestiges of dusk’s blue. He then produced lantern to throw soft light onto the rocks, providing illumination while simultaneously enabling us to also capture details of the night sky. I was impressed to see how shadows provided the rock with texture yet the detail was not burnt out, despite my 30-second exposures. Clouds scudding across the sky left ethereal patterns in my night images of the Hopewell Rocks. I was surprised to see how the moonrise looked almost like a sunrise, due to my long exposure. Kevin encouraged us to think about reflections in pools of water and to frame shots of the night sky through gaps worn beneath the rocks. The session was fun, informative and productive. Looking at the set of images I created with Kevin reminds me of one of the highlights of my trip to New Brunswick and proves that creative night photography can be way more accessible than many people think. 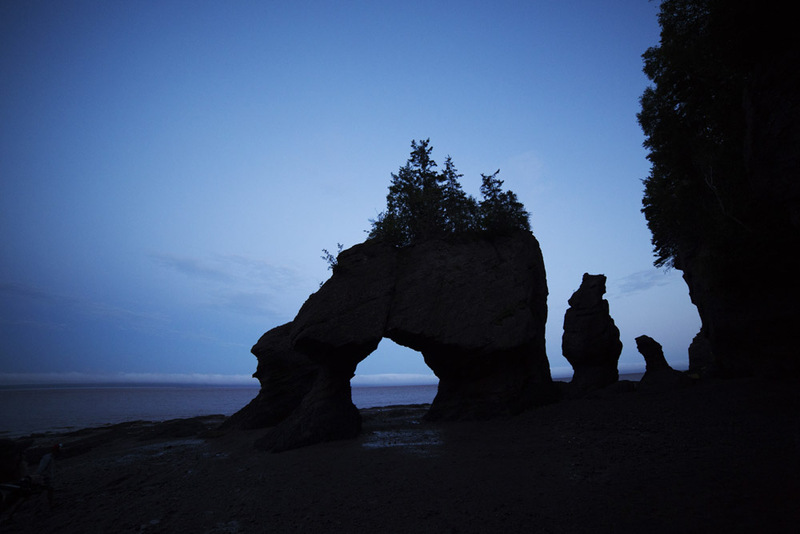 Kevin Snair’s Hopewell Rocks Night Photography Excursion costs CAD$85 plus taxes. Check his website for the calendar of available dates. Remember to take a tripod and a torch during the excursions. A warm jacket will come in useful when temperatures drop. 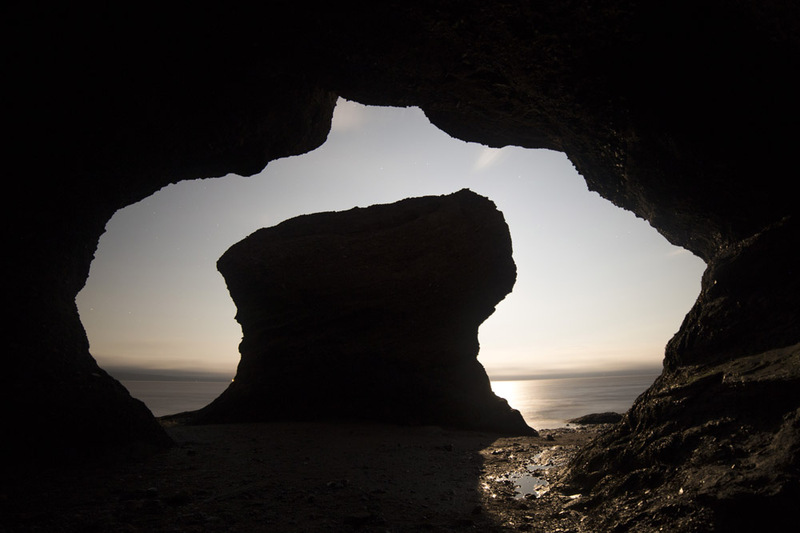 Find out more about visiting the provincial park on the Hopewell Rocks website. The park’s Interpretative Centre has information about the area’s geology, legends and nature. Stuart flew from London Heathrow to Halifax Stansfield International Airport in Nova Scotia, then drove with a hire car to the Hopewell Rocks. The drive takes around three hours. Innisfree Bed and Breakfast (4270 Route 114, Hopewell Cape, New Brunswick; tel. +1 506-734- 3510) is a restored farmhouse, built in 1847, within walking distance of the Hopewell Rocks. It is a welcoming place to stay and set in sizeable gardens. Hummingbirds can be seen in the garden, from the property’s porch. Broadleaf Guest Ranch serves homestyle cuisine and is a good bet for Sunday brunch close to Hopewell Rocks. The Tourism New Brunswick website has information about things to do and see in Canada’s only officially bilingual province. 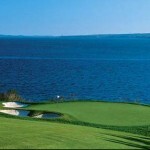 The Explore Canada website has information about New Brunswick and elsewhere in Canada. 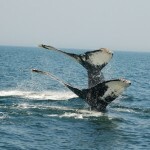 Bay of Fundy – A natural Wonder of the World.